Mumbai: ICICI Prudential Life Insurance Co. Ltd offered 132.37 million shares in its initial public offering (IPO) last month—the first by an Indian insurer. By the time it closed on 21 September, the IPO attracted demand for 10.44 times the shares on offer. The IPO raised Rs6,057 crore, making it the largest initial share sale since state-owned Coal India Ltd, the world’s biggest coal miner, raised Rs15,000 crore in 2010. “ICICI Prudential Life’s IPO had a fantastic outcome. It reiterates that size is not a constraint for good assets and investors—across categories—have appetite for quality issuances," said Anup Bagchi, managing director and chief executive officer of ICICI Securities Ltd, one of the managers of the share sale. Bagchi’s enthusiasm is justified. In the first nine months of 2016, 21 IPOs cutting across sectors have raised Rs19,379.10 crore, the highest for the January-September period since 2007, when 81 IPOs raised Rs28,993.65 crore. Economic growth that the government expects to accelerate to almost 8% this fiscal year (to next 31 March), from 7.6% in the past year, plentiful monsoon rainfall after two years of drought, slowing inflation and a consumption boost expected to come from hefty pay and pension raises given to government employees and retirees have helped turn around sentiment in the primary market. To be sure, the ICICI Prudential stock had a poor debut, dropping 11% on listing; but, then, it started trading on a day that investors’ nerves were fraught after the Indian Army carried out surgical strikes on terrorist training camps in Pakistan-occupied Kashmir. Investors were also concerned about the stock’s expensive valuation. Others fared better. On 1 September, shares of RBL Bank Ltd debuted on the stock exchanges at a premium of 33%, after the private sector lender received a strong response to its Rs1,211 crore IPO. RBL’s initial share sale had been subscribed 69.57 times. Public market response to the first private sector bank IPO in a decade bettered the response to DCB Bank Ltd’s October 2006 IPO, which was subscribed 35 times, and Yes Bank Ltd’s June 2005 IPO, which was subscribed 29.13 times, according to data from Capitaline, a corporate data provider. On 1 August, shares of India’s largest enzyme manufacturer Advanced Enzyme Technologies Ltd listed with a 31.5% gain on the first day of trading. The spectacular listing day performance came after the firm’s Rs412 crore IPO was subscribed almost 116 times. 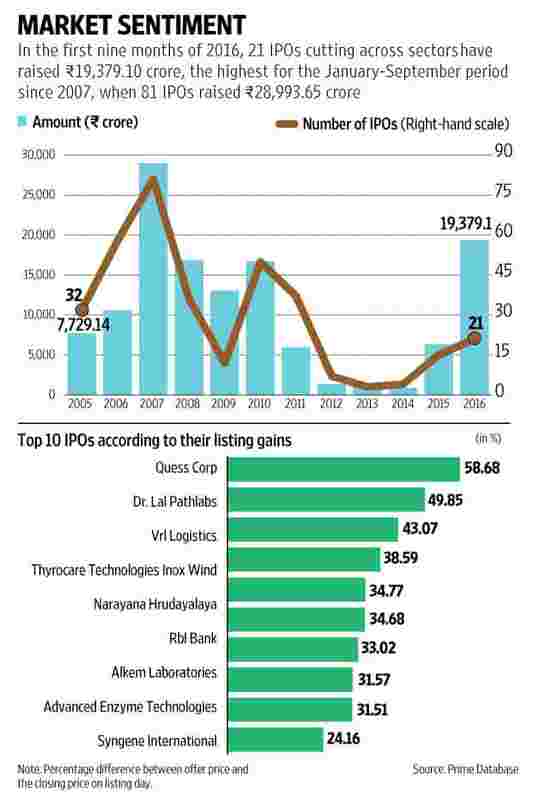 At the start of July, integrated business services provider Quess Corp. Ltd’s Rs400 crore IPO drew subscriptions that amounted to 144.3 times the issue size, registering the fifth highest overall subscription (in percentage terms) for any IPO since 2000. On the first day of trading, the shares of Quess Corp. closed 58.6% above the sale price. Out of the 21 IPOs that hit the Indian primary market in the first nine months of 2016 and went on to list on the exchanges, only six failed to deliver positive returns to investors on listing. Surely, things have turned around significantly for the Indian primary market since the start of 2015. In these 21 months, 42 companies have raised Rs32,993.18 crore through the IPO route, data from primary market tracker Prime Database shows. Several more large IPOs are on the horizon such as Vodafone India Ltd (approximately Rs15,000 crore), PNB Housing Finance Ltd (Rs2,500 crore) and International Tractors Ltd (approximately Rs2,000 crore). In the first nine months of last year, 15 companies raised a collective Rs6,346.01 crore; in 2014, four raised Rs850.51 crore. To be sure, the IPO market is still far from the heydays of 2007; but, clearly, sentiment has turned. Stakeholders say there are several key differences in the bull run that India is witnessing this year and the ones in 2007 or in 2010. The quality of the companies that are approaching the market and their different business models are a major attraction, they say. The fact that most of these companies have dealt with outside institutional capital in the form of private equity investors is another clear differentiator from the kind of companies one saw in the earlier IPO bull runs. “From a quality standpoint and an investor perspective, this IPO run is perhaps the best," said V. Jayasankar, senior executive director and head (equity capital markets) at investment banking firm Kotak Mahindra Capital Co. Ltd. The companies India is seeing come to the market to raise money have an enviable management track record of delivering performance, strong growth, sizeable margins and generating cash, and all these are capital-efficient companies with a good return on equity (RoE), he said. The quality of the companies and the rush of IPOs, both can be attributed to the fact that almost 90% of these companies are backed by private equity. That an outside investor has validated the company is a comforting factor for public market investors. With companies backed by private equity investors, there is a comfort among retail investors that the company and its promoters have had a history of dealing with outside capital and that corporate governance, the board and the overall corporate culture is more robust. Such factors make a private equity-backed company more attractive for investors, say experts. And, given that private equity investors have limited investment periods, the opening up of the primary markets in the last 18 months has resulted in several of them bringing their portfolio companies to the market. “Whenever there is an economic upturn, we see high-quality companies coming up with IPOs. This time down the line, too, we are seeing that happen. What sets things apart this time is that most companies are backed by private equity and so, they are all dressed up with perfect financials and presentation to hit the market," said markets veteran Raamdeo Agrawal, joint managing director of Motilal Oswal Financial Services Ltd.
Another significant way in which the current IPO run is different from the previous ones is the differentiated stories that companies are bringing to the market. “The IPO market is no longer a sector market, it’s a stock market," said Nilesh Shah, managing director of Kotak Mahindra Asset Management Co., a major domestic institutional investor. The asset management firm has invested in several IPOs in the last 18 months such as Inox Wind Ltd, UFO Moviez India Ltd and PNC Infratech Ltd. There are companies coming from sectors that are not necessarily from among the key sectors of the market, Shah said. “We are seeing hospitals and manpower consulting firms hitting the market with IPOs. The secondary market does not have options like these," he added. In the last 18 months, the IPO market has given investors the opportunity to invest in companies such as India’s largest coffee chain Coffee Day Enterprises Ltd, fruit beverage maker Manpasand Beverage Ltd, diagnostics chains Dr Lal Pathlabs Ltd and Thyrocare Technologies Ltd, staffing and business services firms such as TeamLease Services Ltd and Quess Corp. and small finance banks such as Equitas Holdings Ltd and Ujjivan Financial Services Ltd as well as entertainment park Adlabs Entertainment Ltd, among several other under-represented or entirely new growth stories. This is in significant contrast to the IPO phases of the past such as the early 2000s when technology or software services companies were the rage or in the bull run leading up to the global financial meltdown in 2008, which was dominated by capital-intensive industries such as infrastructure, power and real estate. “There is an inclination towards buying growth sectors which are not well represented in the market, which is why mutual funds are big anchor investors. Over a period of time, these stories will make good money for you, that is the rationale," said Shah of Kotak Mahindra Asset Management. The assorted menu of companies that the primary market is serving investors is definitely a welcome change for large institutional investors, which are able to diversify their bets outside of the select stocks in the secondary market that they have been dealing in. “All the major mutual funds or FIIs (foreign institutional investors) are over-invested in the top 50 stocks. If you want to keep pumping more money, you can own more and more of the top 50, or you can diversify. And the IPO market has given them that diversity," said Jayasankar of Kotak Mahindra Capital. When there is a scarcity of good paper in the secondary market, or there is a need to diversify, a strong pipeline of IPOs is always positive, he added. It is not just the sectors from which these companies are coming from that differentiates the current IPO run. Even the reason why these companies are approaching the market is significantly different from the earlier periods. Companies are not seeking to raise large sums of money for capital expenditure (capex). In fact, a lot of companies have not raised any money for investing in their businesses. Most are raising money to provide an exit to existing investors. And stock buyers are displaying appetite enough for these companies. For example, when Mahanagar Gas Ltd went public in June, it did not raise a single rupee for investing in its business. Promoters of the company GAIL (India) Ltd and British Gas Plc sold a part of their stakes. The almost Rs1,250 crore offer for sale issue was subscribed 64 times. Similarly, in December 2015, when pharma firm Alkem Laboratories Ltd hit the primary market with its IPO, where only the promoters of the company were selling their shares, the share sale was subscribed 44 times. “This time around, even a pure secondary issue is accepted. In fact, those companies do much better. The market today understands that there are some investors that have been with the company that need to exit," said Ajay Saraf, executive director at investment bank ICICI Securities Ltd.
For investors, a company that doesn’t need capital seems to be a good bet. “When you raise primary capital, there are several variables that come into play such as where the capital will be invested and how will that play out. So, your return to the investor will also be linked to the primary capital that you put to use in the next 12-18 months," said Saraf. In contrast, in a predominantly secondary offering, the equation is much simpler. “The company is growing and you are valuing it based on that growth and there is no extra variable that you have to worry about as an investment thesis," Saraf added. Several macro factors are also at play. The IPO run is being aided by a strong secondary market as well as strong macroeconomic tailwinds for the Indian economy vis-a-vis other emerging markets. “Market is in a euphoric mood, and there is a lot of liquidity with a lot of money sloshing around," said Agrawal of Motilal Oswal. The BSE’s benchmark Sensex gained 7.68% or 2,006.69 points from 26,117.54 to 28,124.23 points in the first nine months of 2016. A large economy that has overtaken China as the fastest growing major economy in the world and government reforms have made India an attractive destination for foreign investors. “India is increasingly becoming a preferred investment destination within Asia, given the country’s strengthening macroeconomic environment and increasingly facilitative policies that are lending to transparency and strong governance practices," said Arvind Vashistha, head of equity capital market origination, Citi India. FIIs have returned to the Indian market in strength with flows close to $7.75 billion in the year to date, making India among the top three investment destinations in Asia, he added. The domestic capital pool, too, has been strongly investing in IPOs. In fact, in a lot of the IPOs, domestic institutional investors have bet more than their foreign counterparts. “In addition to the global pools of capital that include sovereign and pension funds participation, a marked change has been the ongoing trend of local wealth conversion into financial assets by domestic investors, leading to strong IPO participation by domestic institutional investors such as mutual funds, HNIs (high net-worth individuals) and retail investors, even in times of global volatility," said Vashistha. In December 2015, Mint reported that of the 21 IPOs in that year, DIIs bought more than half the anchor book in at least 12, according to data from Prime Database. Though the market appears to be buoyant, given the recent super subscriptions and strong listing gains, it would be wrong for one to believe that the doors of the primary market are open for all companies. “I would say the IPO market is still weak. Lots of issues are being shelved. It is definitely not as strong as people think. Many issues are shelved. There is a great degree of investor skepticism," said Saurabh Mukherjea, chief executive of Ambit Capital Pvt. Ltd. In June, Mint reported that in the earlier six months, at least half a dozen private equity-backed companies seeking a public market listing failed to do so due to a variety of reasons. Companies such as Warburg Pincus-backed ACB (India) Ltd; TPG and Actis-backed AGS Transact Technologies Ltd; Tano Capital-backed logistics firm Shree Shubham Logistics Ltd; Catholic Syrian Bank Ltd; Blackstone-backed Nuziveedu Seeds Ltd; and CX Partners-backed Matrix Cellular (International) Services Ltd failed to access the primary market even after obtaining clearances from stock market regulator Securities and Exchange Board of India (Sebi) as far back as six months in some cases. According to Mukherjea, one of the reasons for some companies being shunned by the market is that investors are keen to back only winners. “There is a strong investor appetite for champion franchises. However, for any second-round franchise, there is simply no appetite. There are plenty of companies that want to go public. The challenge is that their desire doesn’t quite gel well with the quality of financials the investors are looking for," he said. It is a polarized market, he said, adding that for every five companies that want to go public, only one or two will be able to proceed. According to primary market veteran and chairman of Prime Database group, Prithvi Haldea, the IPO market goes through four distinct phases in a bull run and the Indian market is currently in the first phase of that curve. “The first phase is the one where we see good companies with good pricing, and the second one being good companies with bad or expensive pricing. The third phase is the one which sees bad companies with good pricing, and at the frenzy stage, we see bad companies with bad pricing," he said, adding that India was still far away from an IPO frenzy. Investors are currently supporting good companies with reasonable pricing, he said. “By good companies we mean companies with quality management, a decent track record and in growth phase. In the current IPO market, investors are sector-agnostic," said Haldea. Haldea pointed out that if the current run continues, the market may soon enter the second phase—good companies with bad or expensive pricing. “If the economic numbers turn out to be good, the secondary market continues the momentum and the monsoon progresses well, we may gradually enter the phase two of the IPO market. While I don’t see it happening for the next 3-6 months, it is not ruled out beyond that," said Haldea. For now at least, most market participants don’t see major concerns for the IPO market. “This is not a short-term trend. One can expect the market to remain robust for the next three to five years," said Vikas Khemani, president and chief executive at Edelweiss Securities Ltd. The market will see more companies come up for IPOs, given that there are several tailwinds such as falling interest rates, accelerating economic growth, a gradual pick-up in the investment cycle and consumption cycle as well as the reforms push such as the passage of the goods and services tax (GST), said Khemani. “So far, we have not seen the capex-heavy industries come to the market. As the economy improves and the woes of these sectors are removed through policy interventions, such sectors, too, will start approaching the market," he said.